Greg Sanchez, former chief technology officer of the health and federal civilian division at General Dynamics‘ (NYSE: GD) information technology business, has been appointed vice president of strategy and products at Conduent‘s (NYSE: CNDT) government unit, G2Xchange ETC reported Friday. He joined the Florham Park, N.J.-based business process services company after a more than nine-year career at GDIT. 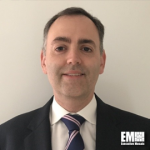 In his previous capacity, he led a team that provided engineering services across the areas of cybersecurity, cloud, data center, managed services, contact center, software development and data analytics. Sanchez served as director of technology services at IT and communications firm Apptis, where he handled tasks related to cloud computing, automation and systems engineering. He worked as an associate at Booz Allen Hamilton (NYSE: BAH) and helped government clients implement strategic and tactical business programs.